Blood leukocytes constitute two interchangeable sub-populations, the marginated and circulating pools. These two sub-compartments are found in normal conditions and are potentially affected by non-normal situations, either pathological or physiological. The dynamics between the compartments is governed by rate constants of margination (M) and return to circulation (R). Therefore, estimates of M and R may prove of great importance to a deeper understanding of many conditions. However, there has been a lack of formalism in order to approach such estimates. The few attempts to furnish an estimation of M and R neither rely on clearly stated models that precisely say which rate constant is under estimation nor recognize which factors may influence the estimation. The returning of the blood pools to a steady-state value after a perturbation (e.g., epinephrine injection) was modeled by a second-order differential equation. This equation has two eigenvalues, related to a fast- and to a slow-component of the dynamics. The model makes it possible to identify that these components are partitioned into three constants: R, M and SB; where SB is a time-invariant exit to tissues rate constant. Three examples of the computations are worked and a tentative estimation of R for mouse monocytes is presented. This study establishes a firm theoretical basis for the estimation of the rate constants of the dynamics between the blood sub-compartments of white cells. It shows, for the first time, that the estimation must also take into account the exit to tissues rate constant, SB. Blood leukocytes are found in two sub-populations constituting the circulating and the marginating pools. The elements of these two sub-populations are interchangeable, i.e., marginated leukocytes return to bloodstream and vice-versa [1–3]. Therefore, a dynamical equilibrium situation occurs, and blood cell counts should reflect the rate constants of margination and return to circulation of those cells. Several studies addressed the relationships between the sub-populations of white cells within the blood pool. Among other features, the ratio between the sub-populations under normal conditions , under altered states [4, 5] and the stability of the equilibrium situation (i.e., to resume a previous value after perturbations, [e.g., [6–8]) were approached. It is presently accepted that the blood sub-pools play an important role as a white cell reservoir when increased demands supervene. Increased demands arise in both pathological and non-pathological situations, as during exercise [9, 10], burns [11, 12], infectious diseases , inflammatory processes [5, 14], etc.. It is also currently recognized that some hormones acutely alter the dynamics of the blood sub-pools of white cells [6–8]. In this sense, epinephrine is known to possess a demarginating effect that lasts for less than 1 hour, and such an effect is thought to be the result of changes in the rate constants of margination and return [2, 6]. Therefore, the interplay between marginating and circulating leukocytes is a relevant issue that should be taken into account in the interpretation of many results. On the one hand, it is tacitly assumed that the rate constants of margination and return have higher values than other rate constants related to the dynamics of white blood cells (see below). On the other hand, there is no study addressing such an issue in a formal way in order to provide good estimation of these values. The aim of the present study is to provide the theoretical background to perform estimations of these rate constants, which may prove relevant for empirical studies on healthy normal situations as well as under altered states of the organisms. In this sub-section, we present a model based mainly on data from monocytes and neutrophils. The model describes the dynamics of three compartments of these cells and also contains the dynamics of specific growth factors. In the next sub-section we show a reduced model from this one, which will then be employed to obtain an improved estimation for the rate constants values. The extensive model is presented to assure consistence of the analysis. Schematic representation of the dynamics of white cells in the organism. The self-reproduction in tissues is represented by "D", without arrows. Crosses denote death or clearance. See text for details. Where α are self-regulatory factors (e.g., CSF-1) and φi refers to cells that take part in the circulating (c), marginal (m) and solid-tissues (T) pools. G is a constant related to the production of self-regulatory factors, and K is the rate constant of their clearance. Notice that the exit to tissues comes both from the circulating pool, φc, and from the marginated pool, φm. Such an exit has the same rate constant, SB, independently of the sub-pool. This partition of the total exit constant rate to tissues in two components is the basic reasoning that leads to the inference about the existence of two distinct sub-pools within the blood white cells . Therefore, a cell that touches, attaches and passes through the vessel wall cannot return to the circulating pool, even though during a certain time interval this cell was marginated (semantically but not functionally). In this sense, these cells exit to the surrounding tissues coming directly from the circulating pool, and their dynamics is contemplated by the product φcSB of the differential equation. Those marginated cells that can potentially return to circulation have their dynamics accounted for by the rate constant R. On the other hand, part of these marginated cells migrate to surrounding tissues and the product φmSB contemplates this rate. This dynamics is also consistent to the empirical evidence that margination and diapedesis are distinct features arising from different signals and receptors . The first step in the analysis was to verify whether the extensive model allows the existence of a stable equilibrium point. An equilibrium point means a set of values of the variables (in this case, φc, φm, φT and α) that does not vary with time (if the system is left externally undisturbed). Stability is related to the behavior of the system in face of perturbations in the variables that displace them to some vicinity of an equilibrium point. The equilibrium point is said asymptotically stable if the system returns to the equilibrium point attained previously. Otherwise, the equilibrium point may be neutrally stable, if the system does not return to the equilibrium point but remains somewhere around it, or unstable, if the system leaves that vicinity away (e.g., ). Notice that one is not able to know, directly from the ratio φm* /φc*, the values of R and M themselves. This value of λ allows a good estimate of R during the fast phase of the returning to the equilibrium point (steady-state of the sub-pools). In the next section, we will work some examples of the application of the present model and its potential relevance. The present study offers the means to compute the individual values of R and M. As stated before, the ratio f* is obtained by measuring the marginated and the circulating pools in steady-state conditions. This ratio is equal to M/(R+SB) (see equation 4). Therefore, its is important to note that the individual computation of R (and M) assumes that a series of other independent measurements were done: (a) φc* (the steady-state value of the circulating pool); (b) φm* (the steady-state value of the marginated pool); (c) SB (the exit rate constant from the total blood pool to tissues). The knowledge of a general production rate value may also improve the picture, even though its is not a primary need. The first example intends to compute the R value for mice monocytes under normal conditions. However, the paucity of adequate data prevents a true computation. Therefore, we will compute an approximate value. The other two examples are completely imaginary. They show the usefulness of the model to address changes in the rate constants that would otherwise pass unnoticed. Simulated perturbation in the blood sub-pools of a white cell type (e.g., monocytes) under three different conditions: normal (blue), tumor carrying animal (red), long-term aerobic exercising animal (green); see text for details. (A) "Raw experimental data", the "discrete" time course of φc after a bolus injection of epinephrine under the normal condition. (B) Log-transformed (linearized) data, under the three different conditions. Notice the linear relationship obtained. (C) "Raw "continuous" data" of the φc time course. Data generated in MatLab 5.3 (The MathWorks, Natick, MA) by built-in numerical integration routines of the set of differential equations of the model. Thus, R = 0.0456 min-1, a value 47-fold greater than SB. In the data simulation, R = 0.045 min-1, therefore the procedure seems quite adequate. This example highlights the use of the present model as well as the difference between the eigenvalue (λ, obtained directly from the data) and the constant R. Also, as far as we know, this is the first attempt to estimate the value of R (and M) under a complete and formal model. Consider, as another example, that mice carrying a certain tumor type have the exit constant rate equal to the normal value (SB = 9.6 × 10-4 min-1). The f* value is 1.3 and these mice have φc* = 490 monocytes/mm3, φm* = 637 monocytes/mm3. Obviously, production rate have increased. Notice the potential confusing situation arising from these data. Does the tumor growth alter the dynamics between the blood pools? The epinephrine experiment (or some analogue) was conducted, and (or, φc(0) = 600). Figure 2C shows both the "normal" and the "tumoral" data. Linear regression of the log-transformed data computes λ = -0.065 min-1 (see Figure 2B) and thus R = 0.0273 min-1 since f* = 1.3. In data simulation, R = 0.027 min-1, again the results are in close agreement with the real parameter value. Therefore, in this constructed situation, one would be able to conclude that the rate constants of the transit between the blood pool were altered by the pathological condition. This could be an important result in tumor immunology, for example, allowing a better understanding of the pathology or devising new treatment strategies. Our final imaginary example is related to the effects of long sustained aerobic exercise. Consider that mice trained in this type of exercise are known to have increased production rate of monocytes. During the steady-state condition of the exercise, φc* = 350 monocytes/mm3, φm* = 700 monocytes/mm3, thus f* = 2. SB increased to 8.5 × 10-3 min-1. An epinephrine experiment is performed during the exercise section and samples are taken during the decaying phase after the injection (the exercise section proceeds during the sampling period). The "continuos" count profile is illustrated in Figure 2C. Linear regression of the log-transformed data (see Figure 2B) computes λ = -0.041 min-1 and thus R = 0.0052 min-1 (in data simulation, R = 0.005 min-1). This is a 9-fold decrease in the R value in relationship to the normal condition. On the other hand, the rate constant M decreased less than 2.5 times in relationship to its value in normal conditions (see above). This result might be important in the understanding of many immune suppression/enhancement phenomena related to certain exercise protocols. Notice that the f* value by itself do not tell anything about the change in the individual value of each rate constant. The compartmentalization of blood leukocytes in two sub-pools is an important feature of these cells. For example, the marginal pool may acutely function as an extra source of cells at increased demand conditions. In this sense, knowledge about the rate constants governing the transit between the sub-pools may prove relevant in studies that approach both physiological and pathological situations. In the present manuscript we provide the theoretical background to support empirical studies related to the calculation of these rate constants. From the general perspective of an extensive model, we first showed that this model corresponds to what is experimentally found in terms of existence and stability of an equilibrium point in the variables (the sub-pools). After that, we reduced the model to a compact one, concerning only the two blood sub-pools of interest here. Within the context of the compact model, it was shown how an impulsive function (e.g., an intravenous epinephrine bolus injection) perturbing the parameters (the rate constants of margination and return to circulation) can be translated to a perturbation in the variables. Then, the returning of the variables to their equilibrium values allows the estimation of the rate constants. This was done by the use of a second-order differential equation (see Methods). From that equation, the fast-decay component was identified and the corresponding eigenvalue contains the rate constants to be calculated. The present study demonstrates, for the first time, how to adequately and completely estimate the rate constants of margination and return to circulation of white blood cells. Notice that first-order differential equations (as equation 5) were employed before in gross estimates of these rate constants (e.g., ). However, the constant then computed comprised the whole eigenvalue, without discriminating its parts. In other words, its was not recognized that the computed value should be partitioned into three components: R, M and SB. The model also allows to establish the relationship between R and M. This relationship includes the SB constant and the ratio between the marginal and the circulating sub-pools, f* (see equation 4). The need to take into account the f* value in the estimation of the constants is another important aspect for the first time presented. Therefore, the model leads to a more precise evaluation on how imposed disturbances interfere with the dynamics of the blood sub-compartments and thus increase our understanding of the physiology/pathophysiology of many conditions. Two imaginary situations of this kind were constructed and analyzed as examples of the use of the present model (see "Worked Examples" II and III). 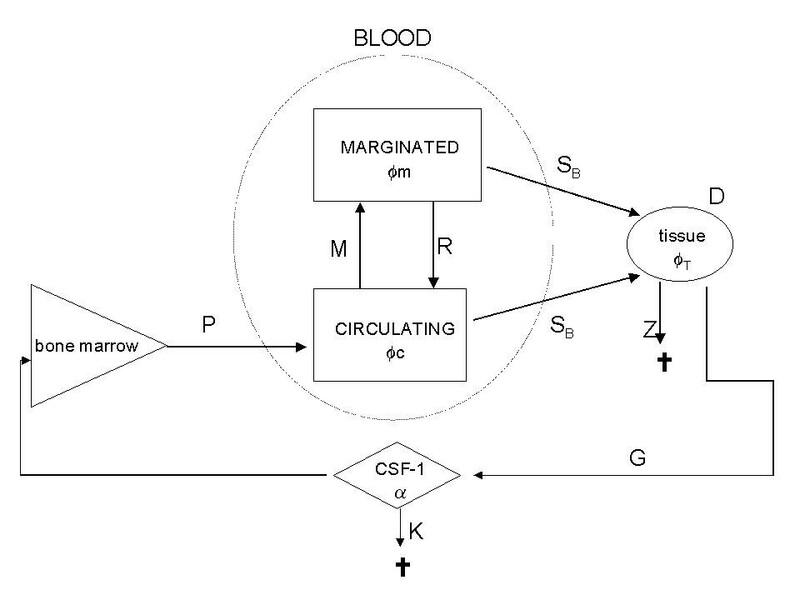 This study provides a complete model to approach the estimation of rate constants of margination and return to circulation of with blood cells. It shows, for the first time, how the value empirically found should be partitioned in order to adequately obtain the desired rate constants. In this sense, we were able to recognize that both an exit rate constant to tissues and the ratio between marginated and circulating cells should be taken into account in the computation procedure. Conditions of existence: (1) Z > D; and (2) K(Z-D) > P2G. The first condition reflects that tissue leukocytes must die at a rate higher than their own local replication otherwise their population would increase forever. The second condition is similar to the first in the sense that it reflects that the self-stimulatory loop must be lower than the loss loop of the system. 1A. All ai must be greater than zero. This condition is true for the system. 1B. a1a2 > a3. This condition is true for the system. 1C. a3(a1a2 - a3) > a4a12. This condition is not easily verified analytically. Therefore, we performed a numerical analysis. Random values were assigned to the parameters (conditions of existence of the equilibrium point verified, see above) and the condition 1C checked (pseudo-random number generator normally distributed built-in function of MatLab 5.3, The MathWorks, Natick MA). This procedure was taken 150,000 times by a routine specifically written for it and the condition always verified true. Therefore, the equilibrium point seems asymptotically stable. The main point in this sub-section is to realize that both φT* and α* are not affected by R and/or M. This is what assures the results concerning the compact model below. Notice that: (a) both eigenvalues are pure real (this means that the equilibrium point is attained without oscillations in the variables); and (b) both eigenvalues are negative (the equilibrium point is asymptotically stable). Given that λ2 < λ1, λ2 is the fast component of the process of resuming the equilibrium value φc* (see sub-section "the demarginated state and its return to the equilibrium condition"). The value of λ2 is -(R + SB)(f* + 1). This value is presented in equation 6.
the ratio between the marginal and the circulating pools at steady-state condition. This study was supported by a FAPESP (State of São Paulo Science Foundation) undergraduate fellowship to K.I. (process number 00/01112-7) and by a FAPESP research grant to J.G.C.B. (process number 00/02287-5). This manuscript was significantly improved by the comments of two anonymous referees.